Painting has become an every day job to me. In „Tips and Tricks“ I described painting as „a job I don’t like very much“. Fortunately that has changed. Because of the monotony of the single steps to be done you develope a feeling for the materials and the techniques. The experiences I made on working on several materials make me feel a lot easier compared to the time I built my first instrument. 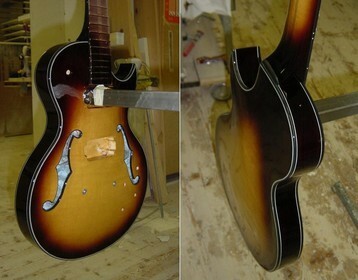 Now putting on the finish has become a favourite job. First the maple is stained. 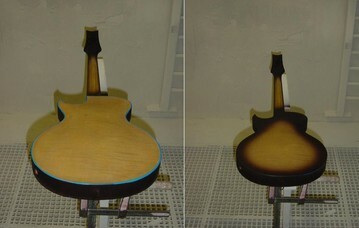 Before the isolation primer is painted the binding is freed of stain to prevent discoloration. I do this with a self-built binding scraper. 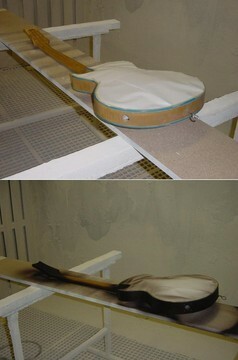 After curing the guitar is painted. The first layer is a primer which closes the pores. This works well on maple, being a dense wood. 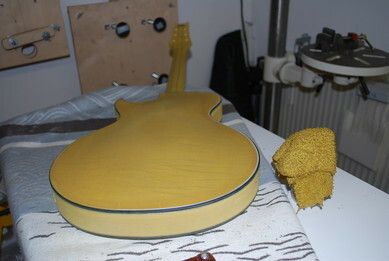 After curing for at least a week (in this case it was a lot longer because of laque of time) everything is sanded. When no pores or open spots are left the next steps follow. I always use the same colour stain. This time however I am not quiet statisfied. 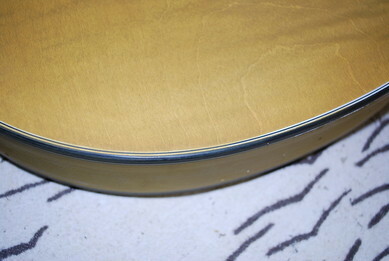 The golden shimmer didn’t come to the wood – this depending on the nature of the wood itself. 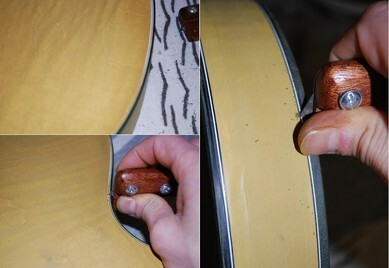 Of course you can sand off everything and do the job once again – just to find out there is no approvement. Or leave it and try to make the best of it during the next steps. 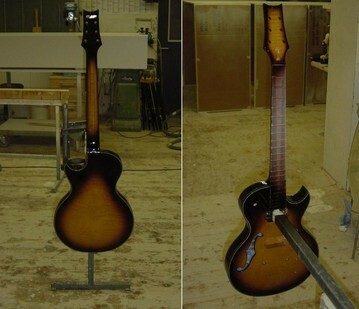 The guitar should (What else can you expect from me?) get a burst. 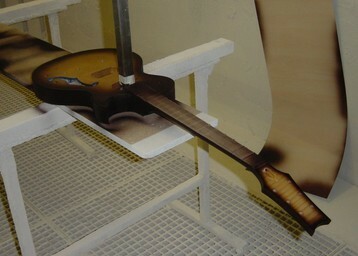 On this instrument the headstock veneer will get a burst as well. A smaller spray gun would be good, but with a bit of feeling it can be done. The steps have have been described, so I’ll do without the details here. 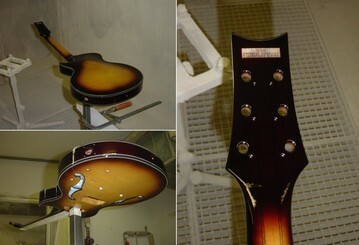 After applying the burst paint follows and everything has to cure again. After another round of sanding the final paint is applied. Next a longer period of curing follows. Please watch the pictures to see the results. I was right on the colour. Sometimes you have to concede and just go on. After the first layers of paint on the body I liked the shade that turned out. 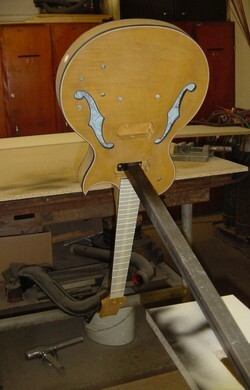 The instrument looks as if it has been under UV radiation for ages. I like this effect as it gives the instrument an irresistable charm. Would be good of course if the next owner agreed. I used polyutheran for the final layer. Now we wait and then we’ll polish. 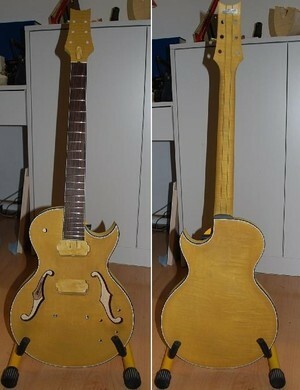 Meanwhile I’ll work on other instruments. As you know there’s always something waiting to be done.